Bolton edged past fellow Championship strugglers Sunderland to send the Black Cats to the bottom of the table. Zach Clough's poked near-post finish from Filipe Morais' free-kick in the first half proved enough as Bolton moved up a place past Birmingham City. Ashley Fletcher forced goalkeeper Ben Alnwick into a save one-on-one before both Adam Le Fondre and Jem Karacan went close to making it 2-0. Alnwick tipped over Callum McManaman's late shot to seal the win for Bolton. Defeat coupled with Burton's 2-1 win at Barnsley means Sunderland are now two points behind the Tykes in 23rd, although with 21st-placed Hull losing 3-1 at Middlesbrough they remain three points from safety. Chris Coleman's side are now winless in five league games and have taken just four points from a possible 24 on offer so far in 2018. 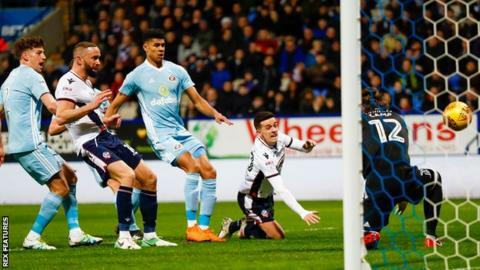 While Bolton's first home win over Sunderland in six attempts came courtesy of Clough's first goal since returning to the club on loan from Nottingham Forest, they could have made the game safe earlier. Le Fondre's free header from close-range was brilliantly saved by Lee Camp before Karacan struck the bar on the follow-up and Sammy Ameobi also curled narrowly wide in the second-half. Sunderland's next Championship game is against rivals Middlesbrough at the Stadium of Light on Saturday. "If we have had a bit of fortune with the goal then the people who follow Bolton will say it's long overdue. "We said nothing will be decided on this game but with Sunderland below us in the table it is a huge win. "We dug really deep and I have got to credit the character of the lads. People expected us to win and that's a different kind of pressure but we handled it well." "We get given a throw-in by the referee but the linesman flags and says it was handball and from the resulting free-kick it is handball by one of their players but the goal is given. "You can't blame us for being slightly frustrated with decisions like that. I thought the referee was indecisive all night. He got it drastically wrong on both counts. It was a bizarre decision. "I never ever make excuses for my team. If we play badly I will say that but I can't say we deserved to lose that game." Match ends, Bolton Wanderers 1, Sunderland 0. Second Half ends, Bolton Wanderers 1, Sunderland 0. Attempt blocked. Callum McManaman (Sunderland) header from the centre of the box is blocked. Assisted by Bryan Oviedo with a cross. Paddy McNair (Sunderland) wins a free kick in the defensive half. Corner, Sunderland. Conceded by Ben Alnwick. Attempt saved. Callum McManaman (Sunderland) right footed shot from the centre of the box is saved in the top centre of the goal. Assisted by George Honeyman. Filipe Morais (Bolton Wanderers) is shown the yellow card for a bad foul. Bryan Oviedo (Sunderland) wins a free kick on the left wing. Substitution, Bolton Wanderers. Reece Burke replaces Jem Karacan. Aiden McGeady (Sunderland) wins a free kick on the right wing. Callum McManaman (Sunderland) wins a free kick in the defensive half. Foul by Jem Karacan (Bolton Wanderers). Corner, Sunderland. Conceded by Andrew Taylor. Attempt missed. Ashley Fletcher (Sunderland) header from very close range misses to the left. Assisted by Callum McManaman with a cross. Attempt blocked. Callum McManaman (Sunderland) left footed shot from outside the box is blocked. Substitution, Sunderland. Callum McManaman replaces Joel Asoro. Corner, Sunderland. Conceded by David Wheater. Attempt missed. Jem Karacan (Bolton Wanderers) header from the centre of the box misses to the left. Assisted by Filipe Morais with a cross. Jem Karacan (Bolton Wanderers) hits the bar with a left footed shot from the centre of the box. Assisted by Adam Le Fondre. Attempt saved. Adam Le Fondre (Bolton Wanderers) header from very close range is saved in the bottom left corner. Assisted by Filipe Morais with a cross. Corner, Bolton Wanderers. Conceded by George Honeyman. Attempt blocked. Sammy Ameobi (Bolton Wanderers) left footed shot from the left side of the box is blocked. Assisted by Andrew Taylor. Attempt missed. Adam Le Fondre (Bolton Wanderers) left footed shot from the left side of the box misses to the left. Assisted by Sammy Ameobi with a headed pass. Offside, Sunderland. George Honeyman tries a through ball, but Joel Asoro is caught offside. Joel Asoro (Sunderland) wins a free kick in the defensive half. Corner, Bolton Wanderers. Conceded by John O'Shea. Attempt blocked. Sammy Ameobi (Bolton Wanderers) left footed shot from outside the box is blocked. Assisted by Adam Le Fondre. Substitution, Sunderland. Josh Maja replaces Jake Clarke-Salter.